Among the handful of species that provide reasonable alternatives to old-growth Genuine Mahogany from South America, plantation-grown Genuine Mahogany is emerging as an alternative to using Genuine Mahogany alternatives. Especially as the Spanish Cedar market continues to tighten, causing concerns over availability, more and more lumber suppliers and customers are looking to plantation-grown Genuine Mahogany. With more predictable pricing and shipping, this unique crop of plantation mahogany is increasingly impacting the Mahogany market. Following the second World War, the British began the planting of Genuine Mahogany in Fijian plantations. Over the next six decades, the stock grew quickly and the natural replanting spread has surprised plantation owners with 3 and even 4 generations of healthy, sustainably managed Mahogany trees. These plantations provide ideal examples of low-impact forestry practices and strategic thinning that continually produces strong primary stock. Although largely unnecessary due to Mahogany’s natural tendency toward spreading, stringent replanting guidelines remain in place. The result is a properly managed forest that provides a self-sustaining ecosystem that will supply quality Mahogany for years to come, promising an even greater supply in 50 years than it does today. Generally, we at J. Gibson McIlvain are far more likely to supply and promote lumber from traditional old-growth forests than plantation-grown stock. Often, plantations produce sun-drenched trees that grow quickly, prolifically producing branches, along with wide growth rings, pin knots, and bleached coloring. Low density is often a concern, as well. 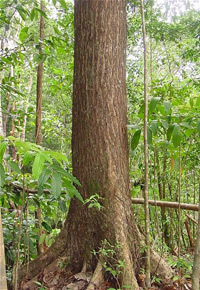 With Fijian Mahagany, however, the lumber bears many of the same characteristics of older forests, with each subsequent generation demonstrating higher quality than the last. The present outlook on Fijian Mahogany is positive, and the future looks even brighter. The reason you won’t find Fijian Mahogany on the CITES appendices is simple: It is not endangered. That fact translates into customers’ not having to deal with cost hikes or import delays; instead, we find steady pricing that promises to be lower than those of African Mahogany and promises to fall below those of Spanish Cedar, simply because of the nature of a plantation-grown species. With the same working properties, consistency, and coloring as old-growth Genuine Mahogany, this plantation-grown alternative is certainly worth considering. For those looking for responsibly harvested, high-quality Mahogany, J. Gibson McIlvain highly recommends plantation-grown Fijian Mahogany. In fact, at J. Gibson McIlvain, we currently suggest plantation-grown Fijian Mahogany over both old-growth Genuine Mahogany from South American as well as African Mahogany. 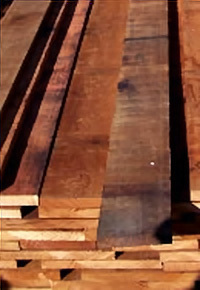 Importing Bolivian Mahogany is now considered a Lacey Act violation, and African Mahogany demonstrates inferior quality as well and poses environmental concerns. As the economic climate and environmental issues surrounding these highly prized species will continue to fluctuate, we will continue to research and re-evaluate the issue.